Excluding construction, only 6,700 jobs were created outside Dublin in the last year. Some commentators have recently challenged the assertion that there is no recovery outside Dublin. Dan O’Brien does up the numbers and show, with the exception of the West and recently the Mid-East, jobs growth has been robust outside Dublin. Stephen Kinsella made a similar point in a recent Sunday Business Post article. What they point out is correct. However, I want to look under the hood and see in what sectors jobs are being created. In this post I will focus on the market economy. This is essentially the private sector which contains almost all traded sectors (that is, almost all sectors that trade internationally). This excludes non-market sectors: public administration, education, health, arts/leisure and the agricultural sector. These are called non-market because of their high reliance on public sector activity or public subsidies. There are few traded goods and services in this sector. 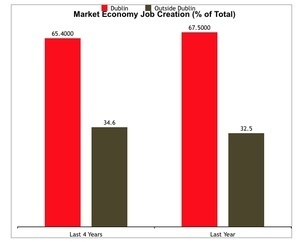 What is the breakdown between Dublin and outside Dublin when it comes to the market economy? Let’s first look at the total economy – both market and non-market sectors. 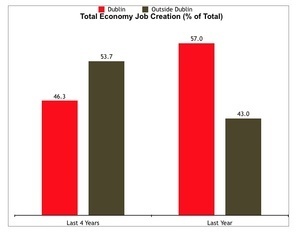 Over the last four years there has been more job creation outside Dublin than in the capital city (though we have to remember that the CSO undertook an adjustment in their sampling base which saw agricultural employment adjusted upwards significantly, though it didn’t necessarily rise in the economy). In the last year, however, Dublin has benefitted from most of the job creation in the state – 57 percent of the jobs created were in Dublin. When we turn to the market economy, however, a different story emerges. Whether in the last four years or the last year, Dublin has generated approximately two-thirds of jobs in the market economy. Outside Dublin, even though 70 percent of the total labour force resides there, only a third of jobs were generated. That is a severe imbalance. Let’s drill down one more time and examine the amount of job creation excluding construction. This is not to suggest that construction isn’t an important sector; and after the hit this sector took in the recession there will be a rise as the recovery sets in. But over-reliance on construction, as we know to our cost, is unhealthy. 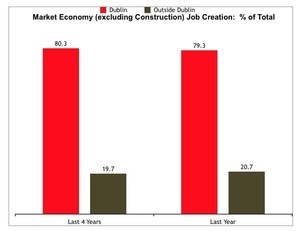 At the height of the boom – 2007 – construction employment made up 13 percent of all market economy employment in Dublin; outside Dublin it made up over 21 percent. When we exclude construction, Dublin has generated 80 percent of jobs in the market economy – leaving the rest of the country well behind. In all these sectors only 6,700 jobs were created outside Dublin last year. That’s not a great trend even if it is heading upwards in the last year. And this is outside Dublin – not an urban/rural divide. Outside Dublin there are large urban areas such as Cork and Galway and substantial city/towns such as Drogheda and Wexford. We don’t have the data available to breakdown how much job creation is occurring in strictly rural areas but it is reasonable to assume that it is proportionally lower than larger cities and towns. In other words, we may be seeing an actual decline in the rural areas leading to higher unemployment, emigration (internal and foreign) or withdrawal from the labour force. This, combined with an ageing population and lower birth rates, could spell trouble for large swathes of the country. None of this is surprising. Market-led job creation will see a trend towards urbanisation as capital and labour are drawn to clusters (IFSC and digital companies) and areas of better infrastructure such as telecommunications. If the Government is serious about a rural or regional strategy it will have to mobilise capital and enterprise activity through public sector mechanisms, which is not the same as the public sector. There is only so long an area or region can rely on non-market services and construction. However, if the Government relies on grants and tax incentives and ‘enterprise zones’, to grow rural economies they will be disappointed; the problem is that there is less and less capital to incentivise in these areas. We will continue to see many areas outside Dublin lag the capital city and other major urban areas. And this will be costly affair – both in terms of public resources; but most of all, the large scale squandering of national and regional assets. Clogging Up The Trickle Down Memo To Progressives The Astrology Of The Irish Economy Anyone For Social Protection Payment Restoration? Posted in Misc and tagged Michael Taft, taft on tuesday at 10:00 am on June 14, 2016 by Admin. The problem is obvious, LAZY FECKLESS CULSHIES! 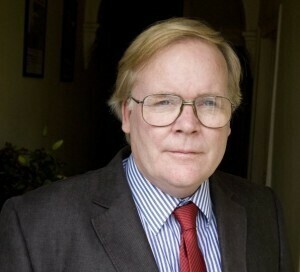 “Outside Dublin, even though 70 percent of the total labour force resides there, only a third of jobs were generated. That is a severe imbalance.” How is this calculated? there are a lot of people that commute into Dublin to work from the surrounding counties – are they included in the 70%? or the 30%? Economic growth happens in cities. It has been a big problem for us in Ireland for a long time that we have refused to accept that cities have economic benefits in & of themselves. They allow for specialisation, they allow all sorts of cultural & economic cross-fertilisation. Interestingly, the agglomeration benefits of cities seems to be increasing globally despite the internet etc. Look over the Census numbers to the mid-1800s. This has shown a clear secular move in population toward urban areas away from rural areas. Why? Because cities are always where productivity is highest. As a result cities are where wages are highest. And people will move where their living standards are best. This is the same the world over. The only disruption to this trend in Ireland was the construction boom in the decade to 2008. No one is recommending a repeat performance of that. Even very rich countries (eg France) have large geographical areas where there is little tradeable economic activity and living standards are lower. Fact checker has a point and I feel Michael is going a bit political on this one, somewhat cherry-picking the data to support his argument. As I agree with Fact-Checker’s contribution I’m not sure what the cherry-picking refers to. And, of course, it is political. Generating economic activity and employment – especially in depressed and disadvantaged areas – requires a political response. It would be useful to survey strategies in other countries to combat rural depopulation and reinvigorate economic activity. But measures such as infrastructural investment, a proper spatial strategy, decentrentalisation of governmental power (to allow regions to pursue dedicated enterprise strategies) and the accumulation of capital through public mechanisms – these and other areas can be explored. I definitely agree on decentralisation in the sense that local councils should have more power, (subject to rigorous SIPO of course). There’s too much expectation that problems should be solved from the “top down” – local authorities should be more empowered to drive policy from communities upwards. But the state of local authorities, at the moment, without any real power doesn’t fill me with hope. It seems as though they’re run at the behest of local “entrepreneurs” rather than for the good of the community. Most of them are simply too small & dealing with overly small administrative units imo. Having a layer of govt at provincial level would be interesting. They could be big enough to make a real difference & possibly hive off some of the more parochial nonsense from the Dail. You can’t seriously be suggesting we abandon our division of local authority areas based on Tudor-mapped traditional counties and shires are you?! Michael – urban areas have always beeen the poor relation when it comes to infrastructure in Ireland. 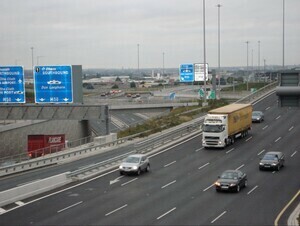 95% of traffic congestion occurs in Dublin, Cork, Limerick and Galway and is related to people travelling to work. (The rest is schools and the occasional sporting event). What is the biggest infrastructure project in Ireland right now? A four-lane road connecting the towns of Gort and Tuam. Which will only ever carry a small fraction of any of the congested routes leading into Dublin or Cork. What is the next largest infrastructure project in Ireland? Why a plan to bring broadband to every hallway in rural Ireland! Notwithstanding the fact that most of the recipients have already CHOSEN to live in one-off housing which makes the provision of pretty much all services more expensive. Or that exising services are sufficient for the vast majority of SME uses. Or that firms who do need fast internet won’t locate in these areas because of a lack of skilled labour anyway. Or that in a decent minority of these houses a Saorview box is the most sophisticated piece of technology that will ever cross the threshold! if you want to promote better spatial strategic planning the key is to provide the infrastructure remotely that will drive investment and relocation to those regional hubs. You can’t divide an entire country with varying levels of diversity and urban centres into 1. The Capital City and 2. Rest of the Country. …..which was a complete flop, I remind you. Due to political spinelessness and and watering it down by trying to give every parish a pump. which means it ought not to be re-imagined and implemented having learned the past lessons? Factor in that much of the rural economy is tourism, which to some extent relies on being backward and underdeveloped. Agriculture which we’re marketing as an untainted product so have to throttle industry and manufacturing. Also, regarding 70% of the workforce living outside Dublin I have to kind of question this. I remember seeing a post on Broadsheet about a year ago demonstrating a heatmap that showed 80% of the population live in about 10% of the country (i.e. Dublin) and that’s not even counting the greater Dublin area. As somebody else said, Cities are by their very nature economic hubs. To see that the Rural/Urban divide in employment is somehow a policy failure is nigh on a contradiction in terms. Was in Donegal recently. Small towns struggling to survive, huge mess of one off housing. The poor planning of rural towns means they can’t act as natural local economic hubs. The villages & small towns had no real connention with its own hinterland e,g, no local food products available to buy in local shops, local restaurants. “Rural” Ireland is just badly planned urban sprawl. Worst of all options..
That is the price society pays when people want to live in houses in the middle of nowhere; much less likely than someone living in a town/village to pop out for a coffee – the local coffee shop closes down. If you need to jump in the car to get a pint of milk, you may as well go to the Tesco in the retail park instead of going into town – the local shop closes down. It is very hard to find any kind of high-productivity activity that locates in an urban agglomeraction with a population <100k. Ireland has a limited selection: Galway, Limerick, Cork and Dublin. Waterford will struggle in this space. Smaller places really do not have much of a hope. That's not to say that there will not be employment elsewhere. It's just that it won't be very productive and highly paid and it won't grow very fast. Viable villages need more than just bad pubs. Many evolved as market towns where cattle & farm produce was sold. That doesn’t go on anymore. Even in laid back French towns there’s a fresh food market. Italy has a very strong movement for supporting local food traditions. We could do that here – local barley = local beer, local horticulture = food market, cafe restaurant. Native tree planing = tourist spot, wood for craft, fuel, building material, mulch to replace fertiliser, orchards for food sustainability (fruit & nuts). We need to join all the dots. This is just low-productivity agriculture with higher margins marketed at urban dwellers who have high incomes because they live and work in cities. You can have a balanced and sufficient nutritional intake on <10% of the average wage. Down from 50% or more a century or more ago. This is because of massive improvements in agricultural productivity and modern supply chain management. It is completely beyond me as to why people think it is in some way virtuous to eat a vegetable that is grown locally and to meet the person who has grown it. But each to their own, it is a pretty harmless pastime. buying local produce whether organic or otherwise is far more sustainable and better for your health, and also tastes better than eating factory-farmed vegetables and fruit grown in greenhouses and picked long before they are fully ripe. The greatest amount of ‘food miles’ take place in the boots of people’s cars. Blind tasting of organic produce has shown no statistically significant improvement in taste. If you restrict yourself to local produce grown in season you will have far more limited culinary palette to work with than I do. Are you sure that’s what the blind taste testing found? I think I read last year alright that some guys in Big Ag funded a study saying that there was no difference in quality or nutrition but everyone knows this is probably complete BS. Anyway provide some cites and we can all review transparently! Leaving that aside, anyone who ever grew a leaf of lettuce in their back yard could easily confirm on taste differences. It stands to reason, if the lettuce was picked in your neighbour’s farm this morning while ripe and still fresh are you seriously suggesting it could not taste any better than something grown hydroponically in Holland? Said this many times, we need to adopt similar strategies as the Europeans and have groups of dwellings together with facilities. Not the one house 2km from the next. we’ve German friends who come over and they can’t understand why this practice of 1 off housing is still going on, cultural or not. Ehh, what was the ehh, question again.